JIO Phone Tracking Order Status Delivery Online : JioPhone has become the most trending in its bookings. 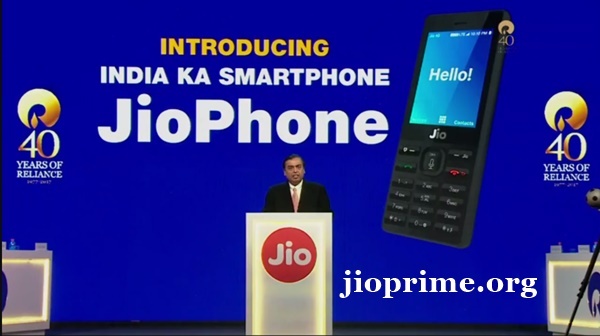 JioPhone Rs 0 4G Phone online booking was started on 24th August at Jio official website, jio.com. Lots of people have already pre-booked the JioPhone through the Jio portal. Here we have given the process to track the JioPhone order status for the pre-ordered customers. Hence this article provides a perfect information about how to track Jio Phone order status, and how to know the shipping date etc. Hopefully, this is the right place to know about JioPhone order tracking. Jio Phone Order Tracking Online : The JioPhone is presently available to buy online on Jio’s official portal, jio.com. Jio has also given the special offer in booking this mobile. Clients placing the order can pay Rs 500 initially and after that, they can pay the balance amount (Rs 1000) at the time of delivery of the mobile. This is the best ever offer given by the Reliance Jio. Customers those have already booked the JioPhone and booking further can track the JioPhone shipping through online. The detailed process is given below. If you are one of the users who were able to pre-book a JioPhone, you have the option to track your order, through both online and offline channels. In order to track Jio Phone bookings online, users can use the MyJio app. 1. First open the MyJio app and tap on the Manage Booking option. 2. On this screen you will need to provide your registered phone number and OTP. 3. Users will be directed to the My Vouchers page. Again, as of now, the Status field is blank, but it should show the delivery date and the store where the phone can be picked up from, as soon as the deliveries begin. 4. There is also an option of transferring the JioPhone booking using the MyJio app via the Transfer option in the Manage Bookings section. After pre-booking the mobile, users will be receiving a voucher. This voucher can be used to buy the Jiophone from any Reliance Digital store. 1. Customers can track the Jio phone by making a call to Jio customer care number 18008908900 and follow the IVR instructions. 2. While calling to this number, users must call from their registered mobile number. 3. The registered mobile number will be used by the customer care to track the present order of Jio Phone. 4. After that you will receive an SMS displaying the details of your Jio Phone booking, inlcuding the delivery date and the store details. Currently, users are receiving a null against both the aforementioned details. This will probably be fixed as soon as phone draws closer to the delivery dates. Jio Voucher – What it consists? Jio Voucher will be given to the customers those have pre-booked the JioPhone. This Voucher consists the info that is useful for tracking. This Jio Voucher is important to get the JioPhone and also the Voucher carries Rs 500 worth. Using this voucher user can check the status of shipping of the JioPhone. Customers those have pre-booked the JioPhone can track the order by making a call to 18008908900, which is Reliance Jio customer care number. This number will not work if the customers call from the unregistered mobile number. The customers pre-book JioPhone will get the message stating that your order is successfully placed and the shipping will be done in another 1-2 weeks. JIO Phone Order Delivery Date/ Pick Up : Jio Mobile will be Delivered from September 1st and its will be delivered basis on first booking basis using token id number. ask your doubts in below comment section. My register no. is 7005661068 and my pin code is 795001 and I did not see any voucher details in it but it says status created. Pliz need help. Call to toll free no18008908900 and follow the instructions and you will receive the information through SMS. to know the status, call 1800 890 8900. But reality is that this number does not exist. so what can we do further. my prebooking is on 24th august at 8.53 pm. Jio Mobile kob milenge ? I have not received any voucher.On line booking is successful,I have only transaction Id. How can I get token no. I BOOK A JIO PHONE FROM JIO.COM WEBSIDE AND PAYMENT DONE OF 500 RUOEES BY INTERNET BANKING BUT I NOT RECIVED ANY VOUCHER DETAILS AND STORE DETAILS. KINDLY VERIFY AND SEND ME MASSAGE FOR TRACKING. Sir we deleted the msg . Can u please resend the voucher number. Prebooking of India ka smartphone JioPhone is successful. Payment of Rs. 500.00 has been received. On availability of JioPhone, you will receive an SMS with store details. To know the status of your voucher, please call 18008908900 from the mobile number submitted during JioPhone booking. What my registered mobile number,or to check mobile status.